Griffin - XB41227 - Survivor Harness Kit for Small Universal Tablets - Black. You've got your tablet in a super-protective Survivor case. Now Griffin's got the one thing that can make your tablet easier to use no matter where work takes youSurvivor Harness Kit for tablets. Griffin's Survivor Harness Kit gives you a way to carry your Survivor-protected tablet where you can get at it quickly and easily, without having to stop and rummage through a backpack or bag. More than that, it gives you a way to use your tablet one-handed, or carry it hands-free. The Harness Kit holds your tablet in its Survivor case via 4 articulating corner clips that stretch to securely grasp with both Survivor All-Terrain and Survivor Slim cases. On its back, it gives you a criss-cross of comfortable, wide elastic hand straps. Slip either hand under the straps and use the other hand to consult your tablet one-handed, all without breaking your stride. Four 3/4" hexagon D-rings triple-sewn into the hand strap corners give you plenty of connection points for the included padded shoulder strap. 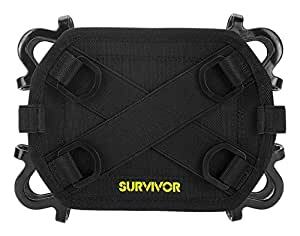 An inner layer of foam padding conforms the harness to the shape of your Survivor case, and a layer of mesh keeps it breathable and comfortable. The Survivor Harness Kit is a versatile tool that extends the field readiness of your Survivor case and your tablet where it matters, whether that's out on the job, on the shop floor or in your own backyard.